For the past 2 years I have been exploring Park Hill in Sheffield, the Grade II* listed council estate and one of Britain's largest examples of Brutalist architecture. The site is currently undergoing regeneration, part has been transformed into luxury flats, whilst part remains boarded up and derelict. The remainder is still inhabited, the residents remaining resolutely on site until finally decanted. I am ever drawn to the site's un-refurbished parts, where memories and layers of the past are almost tangible. I wanted to create observational paintings that spoke of the desolation and displacement of the established communities and temporality of urban landscape. I have been working with materials integral to the estate itself namely concrete and aerosol spray paints, aluminium and found objects. Concrete has been the constant material in my process, I have incorporated it into my paint to create texture and have cast up blocks of it to work on as a substrate. In this latter method I have sprayed on aerosol paints using masking tapes to create the image (photo of the process attached). Concrete is an interesting material to work on as it can be sanded back and abraded and has interesting haptic qualities. Mandy Payne is a multi award winning recent graduate from Nottingham University who currently lives and works in Sheffield. Sheffield's Grade II*-listed Park Hill flats are in the process of being reassessed as a modernist treasure. Yet, as the concrete blocks await gentrification, there is the danger of their brutalist grandeur being aesthetically dissolved. 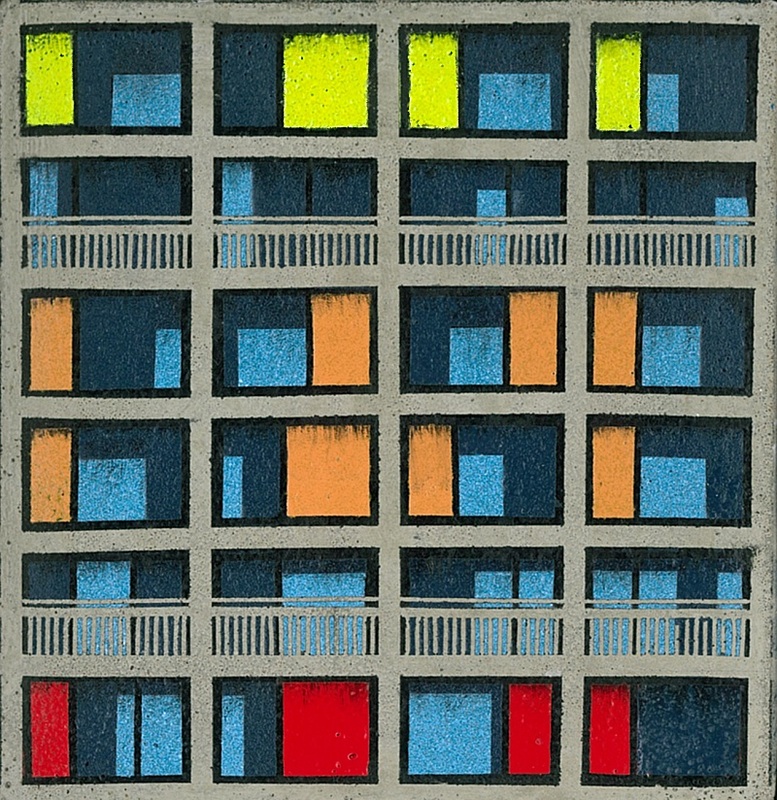 The Sheffield-based artist Mandy Payne recognises this in Between Places And Spaces, a series of unforgiving paintings of the flats. Payne often paints directly with aerosols on to concrete. Her compositions - bold arrangements of blank-faced geometric walls, empty windows and deserted walkways - similarly pull no pictorial punches.